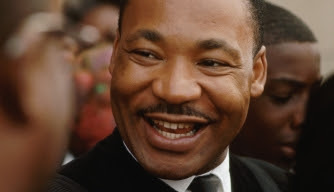 “No one really knows why they are alive until they know what they’d die for.” — Martin Luther King, Jr.
Dr. Martin Luther King, Jr. was a revolutionary man. During his life, he accomplished many extraordinary things that changed the course of America. For starters, he was a civil rights leader and activist who believed in nonviolent protest. He thought that the only way to truly rule out evil was to contradict it with love. He also firmly believed in equality—he didn’t think that anyone should be treated differently just because of the color of their skin. He believed that PoC should be given just as many opportunities as their white counterparts. Because of MLK Jr.’s actions, the world is a much more equal place. PoC now have the right to choose their own destinies and not be defined by their skin color or society’s notions about their race. Because of him, PoC aren’t forced to go to a different bathroom, or water fountain, or college than their white counterparts. Because of him, PoC can walk out of their homes without slanderous comments being shouted their way. Because of him, more attention has been brought towards the problem of poverty in America. Because of him, PoC have a voice. Even after all of the things that MLK Jr. has done for PoC, the battle for complete equality is still ongoing. There’s still racial prejudice in today’s society. When people can be fired because of the way they wear their hair or what religion they choose to practice, sometimes it’s hard to see how far we’ve come. It’s hard to see how far we’ve come when a little black boy can be shot for carrying a toy gun and not get any justice for his death. It’s hard to see how far we’ve come when you can be shot for just wearing a hoodie. But there are some days—days when there’s justice and peace and things that remind us of why we have to keep fighting. They remind us of why we won’t stop until this reign of racism and hate is over. As a black female living in twenty-first century America, I’ve always been judged by the color of my skin. I've always had to conform, mold, and bend myself to what people thought I should be. I've never truly felt comfortable in my skin. I want to thank Dr. Martin Luther King, Jr. for teaching me that racism isn’t something to “get used to.” I want to thank him for teaching me that I deserve just as many chances as anyone else in this world. I want to thank him for teaching me to keep on fighting for what I believe in. I keep on fighting because I know that there has to be a light at the end of the tunnel. I know that there has to be something more then all of this hate and violence, and I will keep fighting until this war is won.